For adults, 120/80 mmHg is considered a normal reading. Children’s blood pressure readings are lower than adults. Their blood pressure is based on a child’s gender, age, and height. This means that what is considered normal or high blood pressure changes as your child grows. High blood pressure can affect the body in many ways. Essential (or primary)—The cause is not known. Secondary—The cause is related to another condition. This may include kidney disease or heart disease. Your child’s blood pressure is measured at least once per year after your child turns 3 years of age. An arm cuff and a special device are used to take the reading. The doctor then uses a chart to find which percentile your child is in. This chart is based on your child’s gender, age, and height. If a reading suggests high blood pressure, your child’s blood pressure will be measured several more times, including one taken at home. This is done in part to eliminate something called "white coat syndrome." Some children can feel very anxious when seeing the doctor. This can cause a temporary rise in blood pressure. The average reading will be used to make the diagnosis. The doctor may also check for other related conditions, such as high cholesterol , diabetes, or other endocrine diseases. The doctor will work with you and your child to create a treatment plan. If your child has an underlying condition, this will be treated. 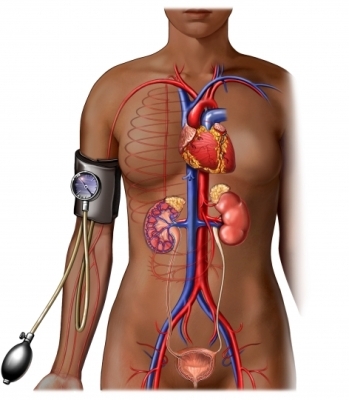 Treating the underlying condition may help the high blood pressure return to normal. Eating a healthy diet . Keep the diet high in fruits and vegetables , and whole grains. You may also need to limit how much salt is in your child’s diet. If your child is overweight, follow a safe weight loss program. Use a program recommended by the doctor or dietitian. Encourage your child to participate in regular physical activity. Encourage your child to eat a healthy diet that is rich in fruits, vegetables, and whole grains. If your child is overweight, talk to the doctor about safe ways for your child reach a healthy weight. Encourage your child to participate in physical activity on a regular basis. Talk to your child about the dangers of smoking. Be a good role model for your child. For example, eat healthy food and participate in family physical activities. Limit the amount of time your child spends in front of a screen. This includes watching TV, playing video games, or using the computer. Aim for less than 2 hours in front of a screen per day. Blood pressure levels for boys by age and height percentile. National Heart Lung and Blood Institute website. Available at: https://www.nhlbi.nih.gov/files/docs/guidelines/child%5Ftbl.pdf. Accessed November 10, 2015. High blood pressure in children. American Heart Association website. Available at: http://www.heart.org/HEARTORG/Conditions/HighBloodPressure/UnderstandYourRiskforHighBloodPressure/High-Blood-Pressure-in-Children%5FUCM%5F301868%5FArticle.jsp. Updated August 8, 2014. Accessed November 10, 2015. Hypertension. EBSCO DynaMed Plus website. Available at: http://www.dynamed.com/topics/dmp~AN~T115345/Hypertension . Updated November 20, 2017. Accessed December 21, 2017. Hypertension in children and adolescents. EBSCO DynaMed Plus website. Available at: http://www.dynamed.com/topics/dmp~AN~T900113/Hypertension-in-children-and-adolescents . Updated November 14, 2017. Accessed December 21, 2017. NHLBI integrated guidelines for pediatric cardiovascular risk reduction. EBSCO DynaMed Plus website. Available at: http://www.dynamed.com/topics/dmp~AN~T900917/NHLBI-integrated-guidelines-for-pediatric-cardiovascular-risk-reduction . Updated February 12, 2013. Accessed December 21, 2017. Schub T, Uribe L. Evidence-based care sheet: hypertension in children and adolescents. EBSCO Nursing Reference Center website. Available at: http://www.ebscohost.com/pointOfCare/nrc-about. May 13, 2016. Accessed December 21, 2017. Screening and treating kids for high blood pressure: AAP report explained. Healthy Children—American Academy of Pediatrics website. Available at: http://www.healthychildren.org/English/health-issues/conditions/heart/pages/High-Blood-Pressure-in-Children.aspx. Updated August 21, 2017. Accessed December 21, 2017.